Intersection of Sets: An intersection of two or more sets is the set containing all the members that are in all the sets. Figure 1: Intersection. Click on the image to see a representation of A ∩ B. An intersection of two or more sets is a set containing the members that are in all of the sets. This is spoken, "Set C is the intersection of sets A and B." This is written, C = A ∩ B. Table 1: Properties of the intersection of two sets. McAdams, David E.. Sets . lifeisastoryproblem.com. Life is a Story Problem LLC. 3/12/2009. http://www.lifeisastoryproblem.com/algebra/sets.html. McAdams, David E. Intersection of Sets . 12/21/2018. All Math Words Encyclopedia. Life is a Story Problem LLC. 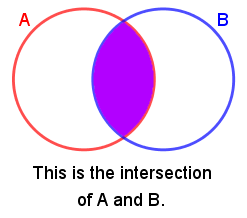 http://www.allmathwords.org/en/i/intersection.html.